Some of these row houses on Beech Street in Holyoke will be repaired during a one-day volunteer project Oct. 20 organized by Revitalize Community Development Corporation. A nonprofit devoted to preserving housing stock in western Massachusetts is bringing its signature single day block rebuild to Holyoke for the first time. 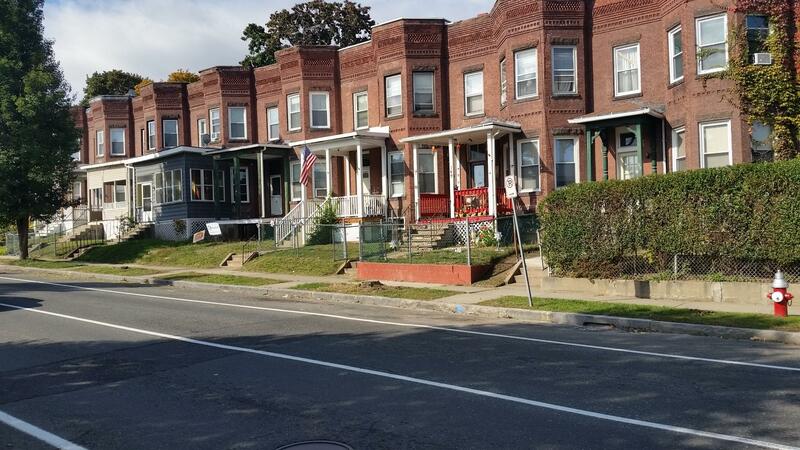 A dozen row houses on Beech Street in Holyoke will have leaky roofs patched, masonry repaired, energy-efficient windows and doors installed, steps fixed, railings added, and more. Much of the work will be done on a single day this week, Thursday, when hundreds of volunteers, including some skilled contractors, descend on the block. The repairs that are planned at the home of Neil Doling will allow him to remain in the house his family bought 65 years ago on the GI Bill after Doling’s grandfather served in World War II. "I was overwhelmed that I am getting this opportunity to save my house that was basically falling down around me," said Doling. Contractors already installed a new porch on the house. In the coming days, the roof will be replaced and a new storm door hung.
" It is a God-send," said Doling. Like Doling, the owner-occupants of the houses slated for repairs are low-income. Some are elderly or disabled. Four of the homes are owned by military veterans. The home improvement initiative called the “GreenNFit Neighborhood Block Rebuild” is run by Revitalize Community Development Corporation. President and CEO Colleen Loveless says the objective is to make the old houses safe, healthy, and energy-efficient. "People have lived here for many decades and we are trying to help preserve these homes and help people stay in their homes and preserve their quality of life," explained Loveless. Beech Street was chosen for the block home rebuild in collaboration with Holyoke city officials. Revitalize CDC received $100,000 from the city’s federal Community Development Block Grant funds. Revitalize CDC has for the past several years organized annual one-day home repair initiatives in Springfield’s Old Hill neighborhood resulting in hundreds of houses being saved. This is the organization’s first such effort in Holyoke.
" We expanded into Holyoke in 2015 and we welcomed with open arms by Mayor Alex Morse, the city council and city departments. We sat down and had several meetings and talked about how we could impact the city and preserve the affordable housing stock," said Loveless. Loveless says about 200 volunteers are expected to pitch in Thursday.
" I think we will be able to get a lot done in the day," said Loveless. " We'll have a little block party at the end of the day to celebrate. It is a great sense of community." In addition to the home repairs, a small city park and a YMCA playground in the neighborhood will be repaired and cleaned-up. Over a thousand volunteers are expected to pitch in this Saturday in Springfield, Massachusetts to help repair more than 60 homes. It is part of multi-year effort to restore the housing stock in one of the poorest neighborhoods in the United States. Massachusetts Governor Charlie Baker today announced funding awards for rental housing development across the state and highlighted a pilot program to open new preschool classrooms. He did both during a visit to Holyoke. Baker announced funding to build or preserve almost 1,500 apartments at 23 projects in 15 communities across the state. He made the announcement at one of the sites chosen—Lyman Terrace, a 76-year-old, 167-unit public housing complex in downtown Holyoke, where tenants fought a plan a few years ago to demolish their homes. An organization that works to preserve the stock of affordable housing in poor neighborhoods is expanding into a western Massachusetts city with one of the highest poverty rates in the state. Revitalize CDC, which has helped hundreds of families keep their homes in Springfield with volunteer-driven mass rebuilding projects through the years, is expanding into Holyoke with an initiative to repair and rehabilitate houses of military veterans.